The integration of Dimension Data, NTT Communications, NTT Data, NTT Security and NTTi3 will create a technology powerhouse. Such a powerhouse will span data centres, application and IT services, managed security, research and development, cloud and system integration under one roof. In other words, can a combined Dimension Data and NTT work for the customer? “The integration will over time remove some grey areas and ambiguity and improve efficiencies in the way its security and cloud businesses operate,” observed Siow Meng Soh, technology analyst at GlobalData. Specifically, the new entity gains access to the security practice, created following the previous acquisitions of Integralis, Secode and Earthwave, housing approximately 1,500 employees and security operations centres across 10 markets. “With cloud, the new company will be able to offer a strong global capability from approximately 10 countries and 18 locations,” Soh added. Furthermore, Soh said the combined entity stands to gain a strong unified communications and collaboration (UCC) capability, an area where Dimension Data led the group as well as many competitors in the market. As a new entrant, Soh said NTT Inc does not have the same “brand equity” as the other providers. “This is exacerbated by the fact that each entity has made many acquisitions in the past, in different markets and they continue to operate with their own brands,” Soh explained. Post integration, and as reported by Channel Asia, NTT Inc will control a broad spectrum of technologies, backed up with extensive network coverage and more than 140 data centres. In addition, the new entity will have 163,000 employees and US$38 billion in revenue with 53 per cent of business coming from outside the domestic market of Japan. 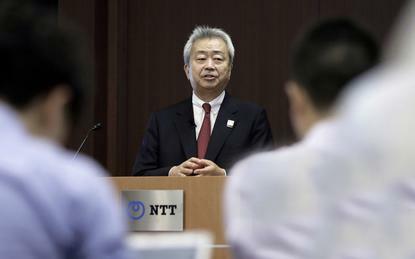 “NTT Corporation has taken another major step to foster collaboration across the three entities,” Soh said. “However, it is maintaining the management structure of NTT Data, management autonomy, and brand for now. “This shows that the company recognises the difficulties in trying to achieve full integration in one go.